The TS90 is designed for ease-of-use- you'll spend less time operating the TDR and more time repairing faults. Simply select the cable type to be tested and the TS90 does the rest. Just move the cursor to the fault to pinpoint its location. On the performance side, the TS90 employs optimised pulsing and sampling coupled with advanced filtering and signal processing techniques to insure the maximum measurement range. That way, you'll always have a clean waveform foreasier fault interpretation. 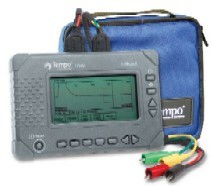 Includes: 2 pair test leads, carrying case, 6 AA alkaline batteries, user manual and TANM application primer.